Product code: ES7105 Categories: Sold Items, Sold Rings. Here is such a magnificent example of a late 19th Century antique diamond engagement ring that will always be loved and admired. 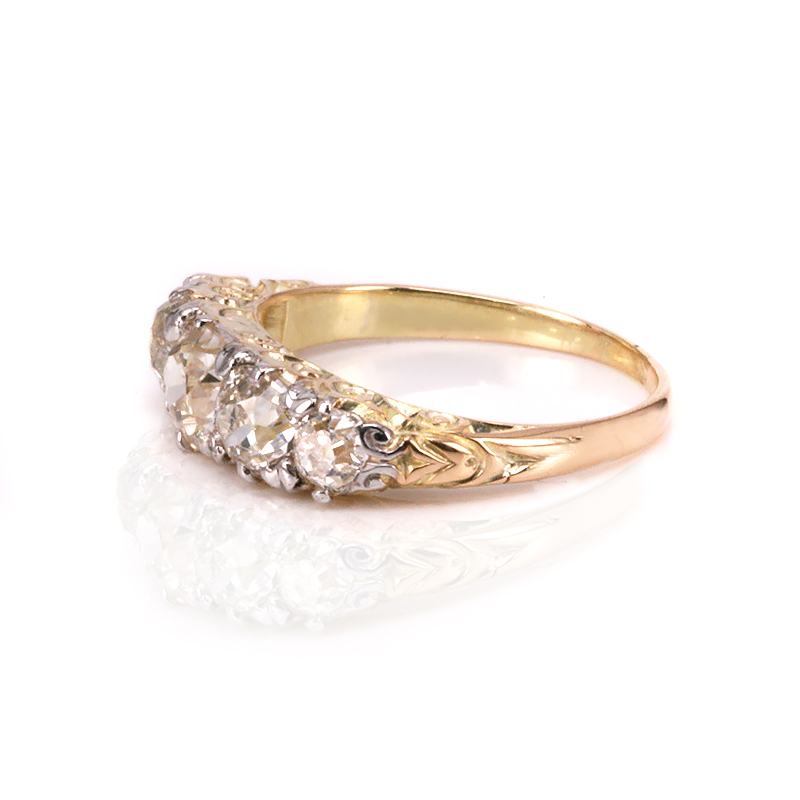 Beautifully hand made in 18ct gold in the 1890’s, this ring is set with five antique European cut diamonds. So popular today, European cut diamonds have made a popular choice for engagement rings today. The five diamonds total an impressive 2.20 carats and while slightly tinted being J/K in colour, they are Vs to Si in clarity and have not only a wonderful sparkle given off by them, but also have all the charm and character of being cut by hand all those years ago as well as being completely conflict free. Measuring 6mm wide at the centre by 19.7mm from end to end, when you look on both sides of this ring, you will see them most amazing and highly detailed scroll work that was made by hand and is so much better quality than modern cast made rings. From all sides and angles, this antique diamond engagement ring is just perfect and will no doubt be loved and admired and looked upon with admiration. 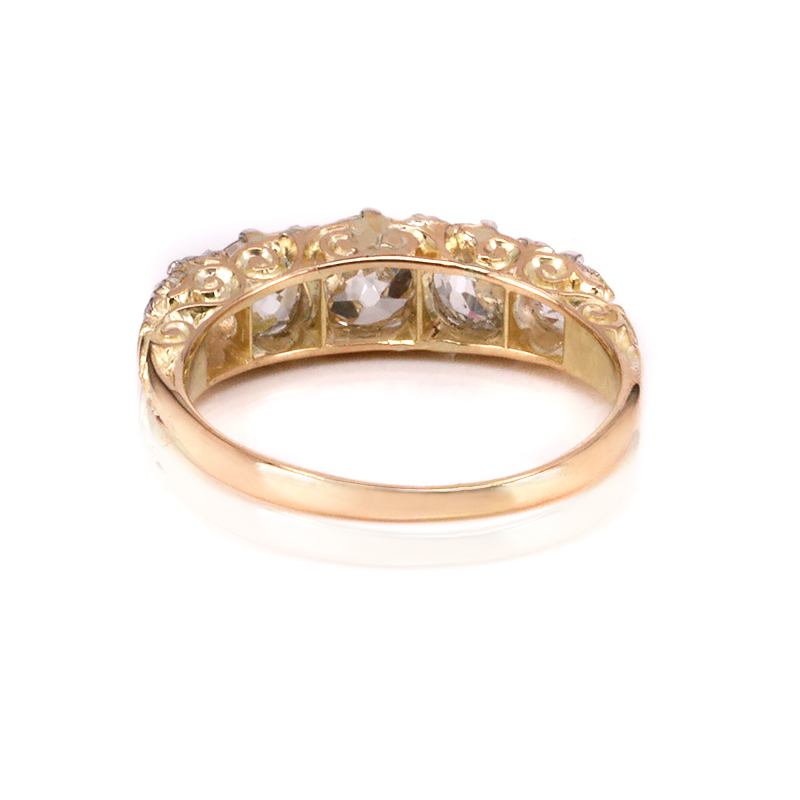 This lovely antique diamond engagement ring dates from the 1890’s and is set with genuine antique European cut diamonds. With scroll work on the sides, this ring was beautifully hand crafted over 120 years ago to such a high standard. Among the many advantages of buying an antique diamond engagement ring, they are also completely conflict free and are perfect for anyone wanting conflict-free diamonds.